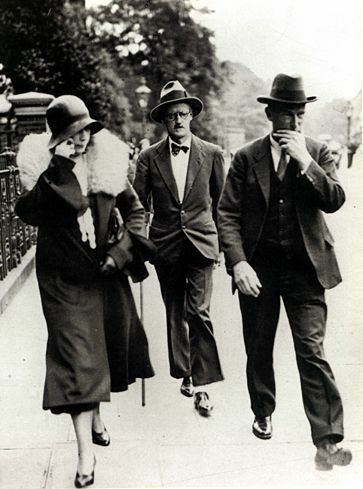 On 4 July 1931 - a date chosen as his father’s birthday - Joyce married Nora, though offering a circumstantial story of a previous marriage between them entered into Trieste which was for some reason not legally sufficient. Emerging from Kensington Registry Office, they eluded some reporters and reached Slater’s, later celebrating in the Robert Lynd’s home at 5 Keat’s Grove where Joyce sang “Phil the Fluther’s Ball” and “Shule Aroon”. A trip was made to Stonehenge and, when Nora’s sister Kathleen (now Mrs. Griffin) came to visit and revealed that she had pawned the watch he gave her in Bognor much to his amusement (‘That’s just what I would do’).